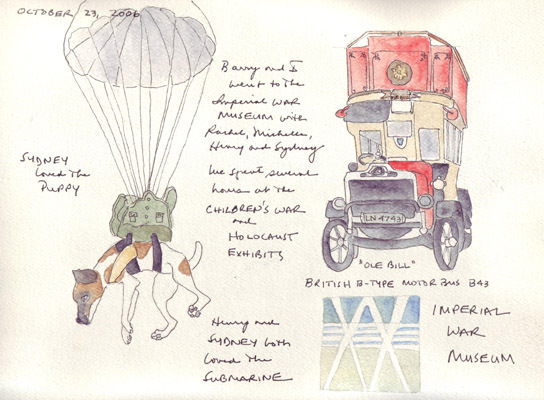 We returned to the Imperial War Museum with our daughter and both of our grandchildren during this visit to London. Our grandson loves the submarine simulation and spends much of his time at the controls. My 22 month old grand daughter loved the puppy that was descending from the roof in a parachute. After they left to return home for naps, my husband and I went through the "Children's War" and "Holocaust" exhibits. Both were excellent and emotionally draining. 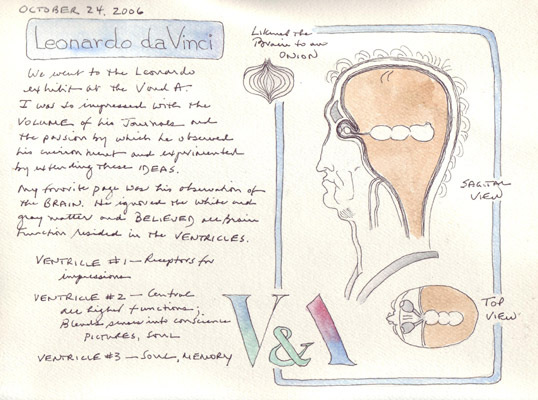 There is an amazing exhibition of Leonardo Da Vinci notebook pages at the Victoria and Albert Museum. I loved seeing his figure drawings, but was especially intrigued by his exploration of the human body. The sketch reproduced above presents his ideas about the brain. He completely ignored the white and gray matter and hypothesized that all human functions were contained in the 3 fluid-filled ventricles: The first was the receptor of all senses, the second blended the senses into consciousness/soul, and the third was the memory. It is unusual for him to be so wrong. One of my treats this trip was meeting London artist Katherine Tyrrell for an afternoon at the David Hockney Portrait Exhibit at the National Portrait Gallery. I have never been attracted to Hockney's Southern California series, but was overwhelmed during this exhibit by his drawings. It is a large exhibit, but there was still time for Katherine to take me to Tea in the Cafe at the top of the Museum. There we spent time enjoying each other's sketchbooks and had time to talk more. 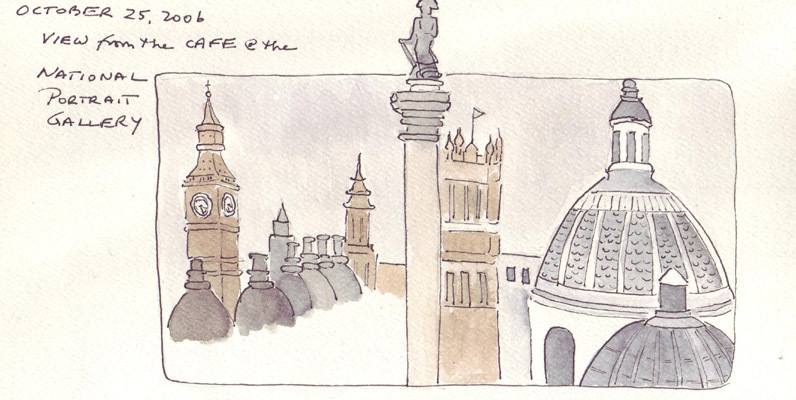 The view from the Cafe is magnificent - and the above quick sketch was taken from a photo that I hastily took before the cafe closed. I have 100s of buttons in my studio from my many, many years of sewing. When we lived in Texas I bought an old English oak button cabinet to use as a side table, and the buttons that I sketched tonight were some of the lovely metal buttons that came with that table. Each one has a very intricate design, regardless of how small. The two largest buttons in this group are 3/4 inch and the smallest is 1/2". Last Saturday I spent the day between the New York City Garment District and Fashion Institute of Technology (FIT) with my new fried and fellow EDM member Paula. She is from Brazil and currently studying at Columbia. 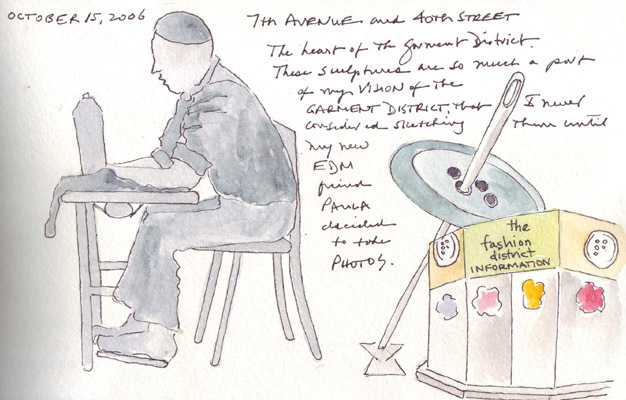 I have walked past the Garment District sculptures at 40th and 7th Ave many times, but on Saturday joined Paula in taking a few pictures of the large button, needle, and garment worker. It sometimes takes new eyes to make you see something that is so familiar! I thought that I would include it as another sketch for the Button challenge. 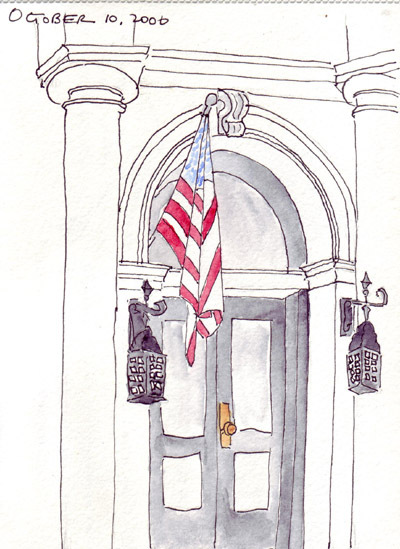 I have never sketched a flag - and was lucky enough to have one in front of a historically landmarked building in my neighborhood in New York City. I want to do multiple sketches of this beautiful building that was the home of a light opera composer in the early 1900s. In the 1930 census that I viewed its value was already estimated at $1,000,000 and it is well maintained and now contains several luxury apartments. 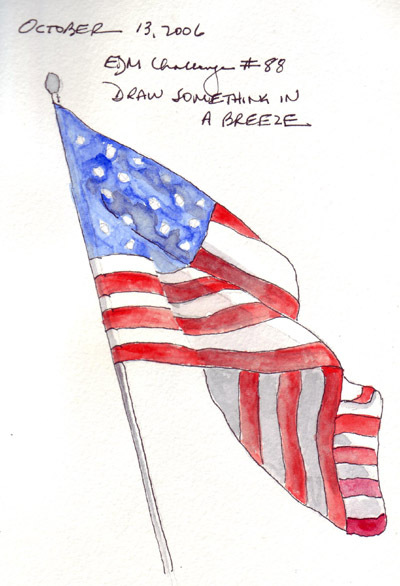 I was able to do the sketch while standing in front of the building and then take a photo of the flag when it was blowing to sketch and paint at home. My husband and I went to DC last weekend to visit our son in their new home near Eastern Market in the East Capitol Hill section. 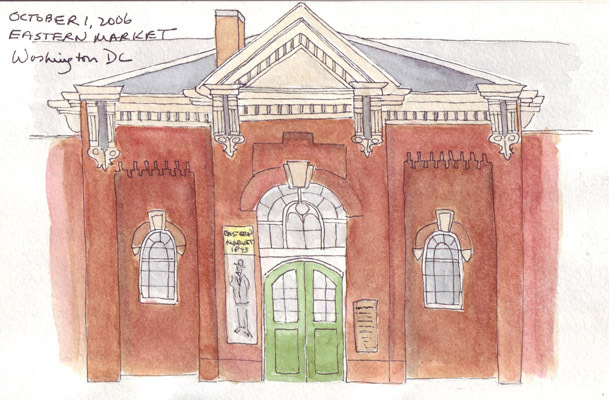 We went to the Market early each morning for food and on Sunday I went 30 minutes before the group so I could quickly sketch the Eastern facade (built in 1873). I stood and then sat on the sidewalk across the street and just finished when they arrived. Then we realized that the image used for the market on T-shirts and by local artists is the North facade. One of the artists in front of the Market told me, "I'd never do that complicated Eastern facade." 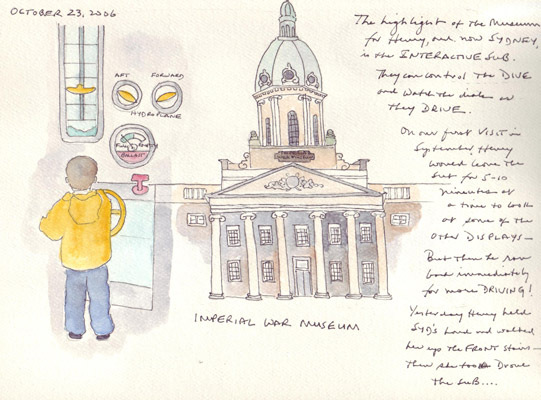 My sketch of the north facade is coming. On Saturday we went to the Library of Congress Book Festival on the Mall to hear Mo Willems, the author/illustrator of the pigeon series of children's books. Don't Let the Pigeon Drive the Bus is a real favorite in our apartment with our grandchildren and he was wonderful - even passing out paper and pencils to all of the children in the audience and then teaching them how to draw the pigeon! 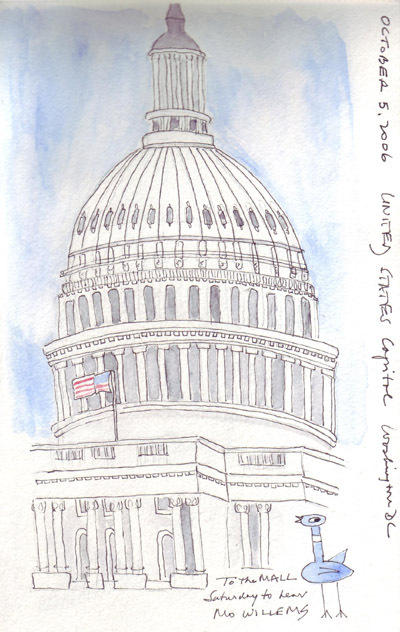 We walked home up the Mall toward the Capitol, but I didn't have time to sketch the rotunda. This sketch was done from a photo taken as we walked by. 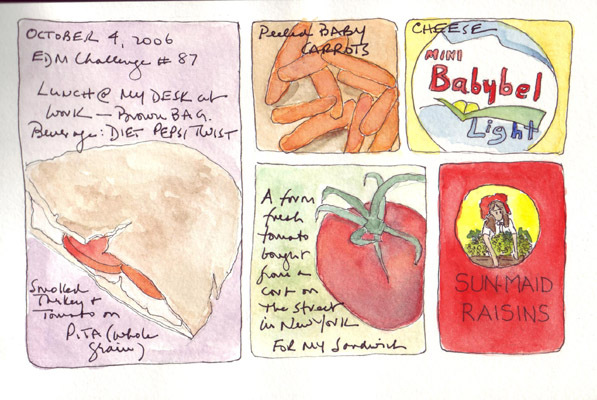 The grid format was perfect for sketching my lunch today. My work always far exceeds the amount of time I have in any day, so whenever possible I bring lunch and eat at my desk while reading, answering email etc. Some days lunch is provided at meetings and I have some control over the menu so the choices are reasonable. I'm not a health freak - and it takes alot for me to pass up potatoe chips, french fries, juicy big burgers, melted cheese, tacos and fajitas, and large loaves of freshly baked bread. In the past, when I didn't bring lunch to work, I seemed to eat all relatively unhealthy things that were available in the building and growing older means slower metabolism and the need to reduce calories. The sandwich is smoked turkey and fresh tomato on whole grain pita. I only sketched half. I bought the tomato from a produce cart halfway between my apartment and garage on my way to work and it was really fresh and delicious. The remainder is self explanatory.